What the publisher wants us to know: When Amelia Thistle moves to Finch, her new neighbors welcome her with open arms-and inquiring minds. Among them is Lori Shepherd, who isn't fooled by Amelia's unassuming persona. Amelia is, in fact, a world-famous artist with a rabid and eager-to-stalk fan base. Back in 1993 I came across a then brand new "cozy" mystery series about an American woman who inherited a cottage in Finch, a small English village. Back then I read a lot of cozies! They were fun, clean and not so complicated that I had to keep a spread sheet on who was who and what was going on. 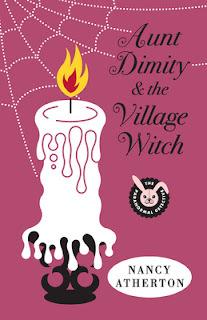 I loved Nancy Atherton's Aunt Dimity series! But after a few adventures with Aunt Dimity, my reading tastes changed and I left dear Aunt Dimity, Reginald the much-loved, fluffy pink bunny and Finch far behind. Fast forward to last month when I realized that Atherton had written a new addition to the series, I wanted to read it and catch up with Lori, her DH Bill and their boys. The cozy mystery usually takes place in a town, village, or other community small (or otherwise insular) enough to make it believable that all the principal characters know, and may well have long-standing social relationships with, each other. The amateur detective is usually a gregarious, well-liked individual who is able to get the community members to talk freely about each other. There is usually at least one very knowledgeable, nosy, yet reliable character in the book who is intimately familiar with the personal history and interrelationships of everyone in the town, and whose ability to fill in the blanks of the puzzle enables the amateur detective to solve the case. In this Aunt Dimity and Lori adventure, there is no dead body, no one is murdered, but it doesn't matter, because there is the perfect mystery! Atherton deftly brings the reader into the village of Finch and it doesn't matter if you've visited these people before or if this is your first visit, you fit right in and enjoy getting to know everyone there, including village new comer Amelia Thistle who's there on a quest that her late brother started. This time Lori still guides the movement of the plot, but Atherton allows other residents as well as Lori's DH Bill and father-in-law Willis, Sr. to help from behind the scenes. Atherton has kept the series fresh and fun! The mystery may be less contrived but it's still a fun ride. I was afraid it would be sad and tired by now, and I am so dang happy to write that it's not! I love that I can recommend this new entry into the Aunt Dimity series! So, if you love a good cozy, or have never read a cozy? Jump on in, it's a fast and fun read. And then go back and read another adventure with Aunt Dimity and Lori Sheppard, they are great friends to have with you at all times. 5 out of 5 cozy stars!!! *This e-galley was supplied to me by the publisher through NetGalley in exchange for a fair and honest review. Definition of a "cozy mystery" found here.